Photograph of the Grammar School Graduating Class of 1905, most likely at Dexter, Maine. 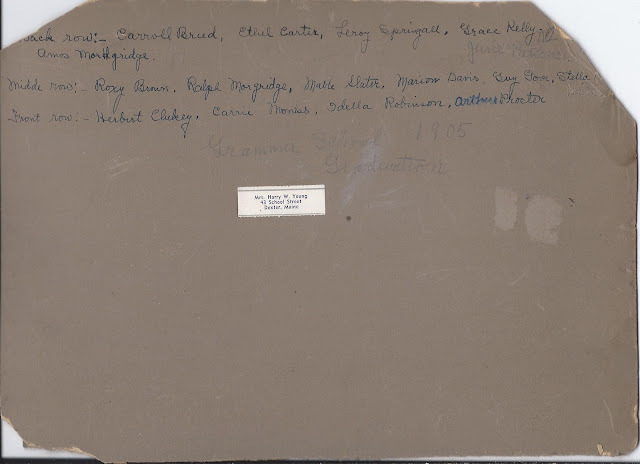 The photograph has identifications on the reverse, as well as an address label of Mrs. Harry W. Young, 43 School Street, Dexter, Maine. 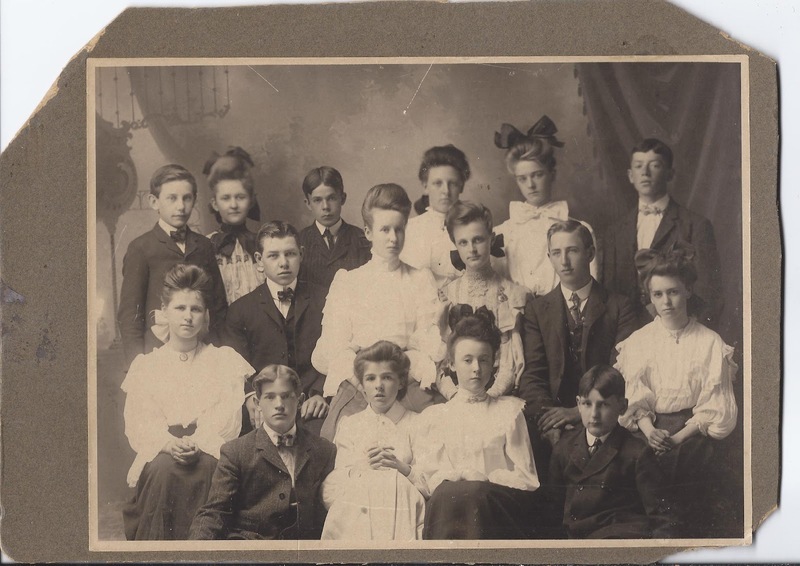 An earlier post featured another photograph of students with the same address label on reverse. Additional information on two of the people shown above, June Parsons and Mabel Slater, is provided in the readers' comments section of that post. Two of the women in the photograph became the wives of Harry Warren Young: 1) June Parsons, whom he married in 1913 and who died about 1940; 2) Mabel (Slater), whom he married in 1944. Harry Warren Young was born 19 August 1886 in Maine, the son of Fred M. and Minnie Frances (Butters) Young, both born in Exeter, Maine. Harry married June M. Parsons on 25 June 1913. She was born about 1889 at Dexter, Maine,the daughter of Forrest Wilbur Parsons and Rose May (Hodgkins) Parsons. Her paternal grandparents were Henry C. and Susan T. (Knowlton) Parsons. Her maternal grandparents were Jairus W. and Mary Ann (Brown) Hodgkins. On 23 August 1944, Harry W. Young married Mabel (Slater) Sims. She was born 30 October 1888 at Dexter, Maine, the daughter of George M. and Emily A. (Martin) Slater. Her paternal grandparents were Marinus Wiest Slater and Hannah (Marshall) Slater. I don't have information on her maternal grandparents, or if Martin was indeed her mother's maiden name. Mabel was married twice before. She was first married to George H. Royal of Hermon, Maine; he died about 1914. She subsequently married Charles Bray Simms; I'm not sure if he died before Mabel's marriage in 1944 to Harry W. Young, or if Charles and Mabel divorced. I found some references online to Charles' death in Broward County, Florida in the 1950s, but I can't corroborate. If you have any corrections or insights, please leave a comment or contact me directly. I knew you would do it eventually! So many of your postings have come so close to to having a close connection to me and this is the closest yet. My father wanted to name me after his favorite Aunt, Stella Mae Young, but my mother wanted to carry on a family tradition of naming the eldest daughter Valmay, so Stella became my middle name instead. Aunt Stella was Harry Warren Youngs sister. I only have memories and photos of Aunt Stella as an old lady, but think the Stella in the Photo could be her. Stella was born in 1888 in Exeter. She never married and lived in School Street next door to my father. I'm looking at a photo of her now taken in 1947 in front of her house in School Street with my father now and now convinced it is her. I took another look, and it does look like Stella Hill, but it was written in pencil after the original IDs as a result of a piece missing, and the ID could be wrong. So you could be right, that your Great Aunt Stella is the Stella in the photograph. I've heard from two people who are related to Harry's wives, and now you, related to Harry himself. Isn't this a great photograph? The photographer took pains to get very close to his subjects but still get them all in. If this is your namesake in 1905 - how special! Did your father ever say what it was about Stella that made her his favorite aunt? Loving, great cook, game for anything, a real card, generous? I will email you a copy of the 1947 photo I have of Stella so you can see what you think. It could be wishful thinking on my part. You're very welcome! Thanks for letting me know that you found this mention of your great grandmother.